Just over 2 miles up and down a rock-strewn grassy hill near Corte Madera in Marin County. Great views! Tiburon mariposa lilies are blooming. These odd flowers exist nowhere else in the world -- just on Ring Mountain. If you go this week you will also see many Ithuriel's spear, Marin dwarf flax, sticky rosin weed, and larkspur, as well as about a million colorful butterflies, including swallowtails, crescents, and buckeyes. Although the trails are muddy in winter, I love hiking Ring Mountain in February when the first flowers of the year bloom and the grassland is a lovely green. This preserve is wonderful year round. I cringe when I see folks tramping through the serpentine grassland photographing the Tiburon mariposa lilies -- there is no need! 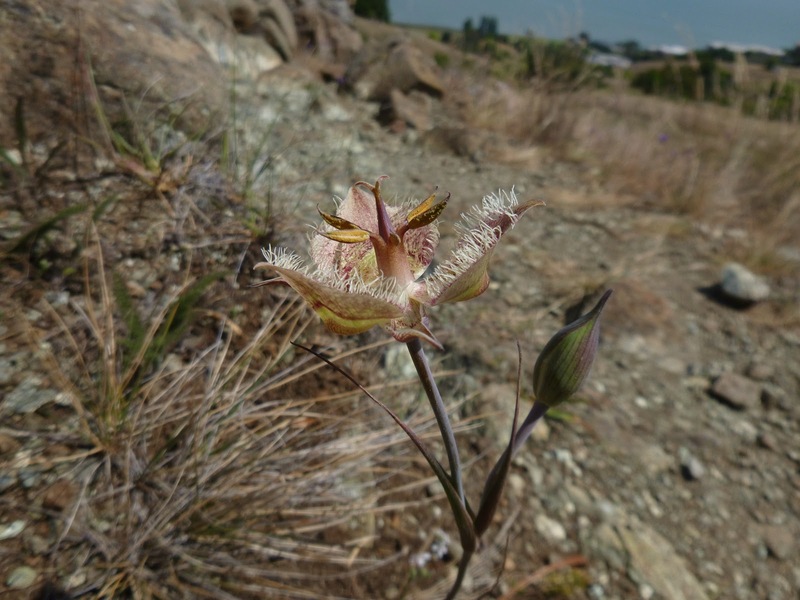 The lovely calochortus flowers bloom right along the path. Ring Mountain is hike number 14 in 60 Hikes in 60 Miles: San Francisco (third edition). Read about this hike on BAHiker. Although the campground is packed, you can still hike at San Mateo County's Memorial Park today. Take an easy-going 5 mile loop through a gorgeous redwood and Douglas fir forest, then go home and plan your next camping weekend here.